Today was a lovely day, my sisters and I had a girls shopping day out which was nice as we rarely get the chance to spend it together as a trio. We set out to the mall and didn't really have anything in mind, I think it was a kind of day where I would probably pick out something I loved. Our first stop was at Exhibit; it's a lovely shop but unfortunately don't think there's a lot round these days, but their clothes are affordable and super stylish and so this is what I picked out.. what do you guys think? I saw a similar one to this at H&M back in January but didn't buy it as it was a little pricey for my liking ( I think it was £24.99). This grey cardigan was on for sale for... £8.00. AN ABSOLUTE BARGAIN. 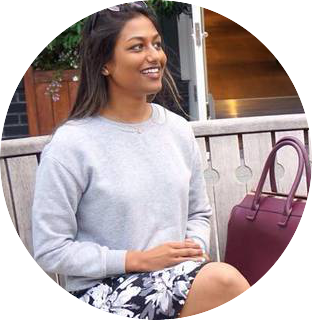 I love the feel of the cardigan- quite cosy and it also has pockets, for me personally it had to be a MUST. Of course a stop at Primark was a needed. I didn't really go overboard as nothing really stood out to me but this gorgeous cardigan caught my eyes. It was something I have been searching for the longest time but I just couldn't find 'the one' but this is a beautiful knit cardigan which isn't full sleeved and it'd be perfect for the spring season too. I also grabbed a black belt and a pair of black leggings. I picked up a few things from Boots- I'm not that addicted I promise! It was purely because there was a 3 for 2 offer on makeup products and I just couldn't help myself. The words 'offer/ sale' I'm totally there. 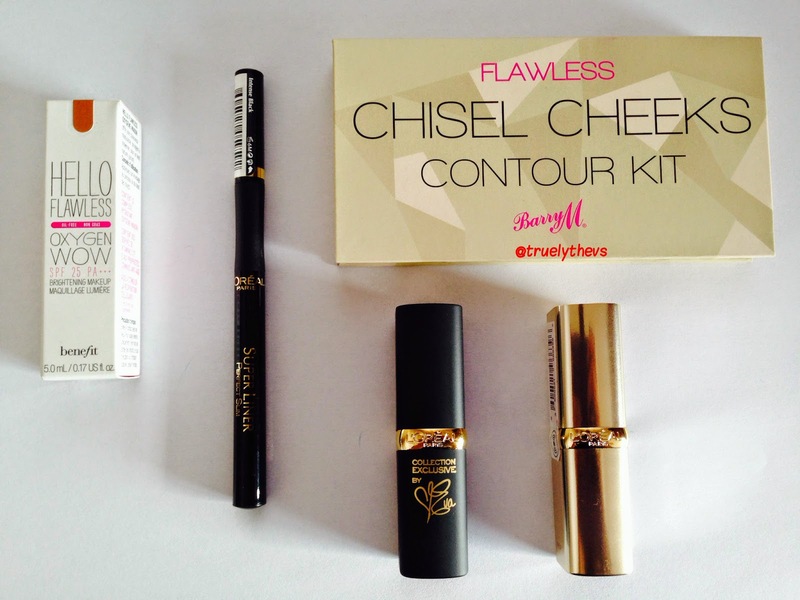 The flawless chisel cheeks contour kit; I initially read it up on Amelia Liana's blog and since it honestly is the cheaper alternative to the Anastasia Beverly Hills contour kit I picked it up. I absolutely adore Barry M so I've got good hopes for this product. The lipsticks are L'Orèal and both are really smooth to apply, with a really nice smell to it too! 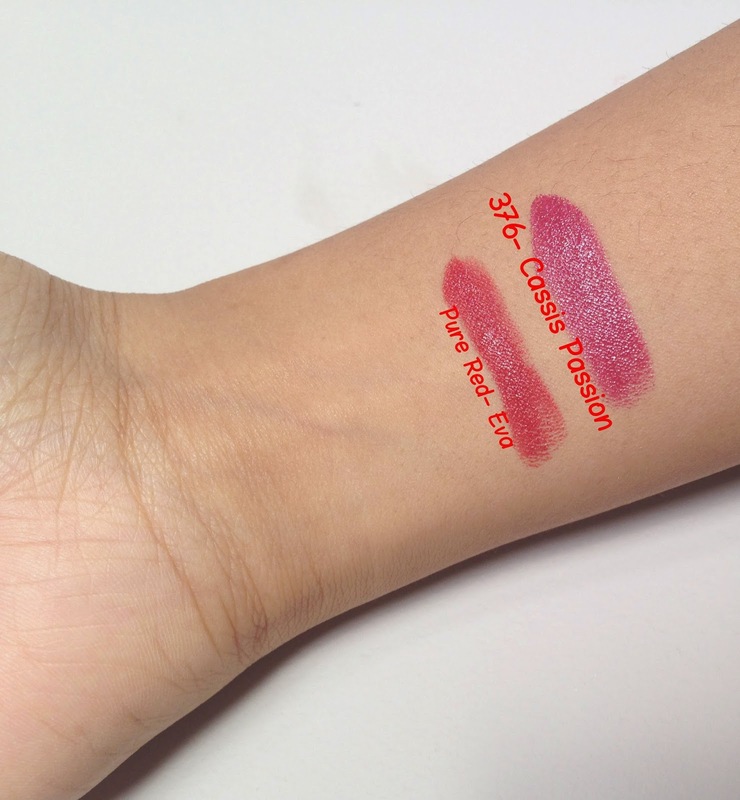 I have swatched them both below; if I'm honest I'm more of a dark burgundy, plum, wine kind of girl but never really tried red but I have to say these both suited really well. I bought the L'Orèal eyeliner as it has quite a fine tip which would be perfect for everyday use and for a more precise look I feel. Last but not least I stopped by at the Benefit counter because I was looking a bronzer but unfortunately it actually matched the colour of my skin so there was no point :( boo! But I met a lovely lady, Victoria. Honestly I have to admit it was by far the best customer service I have ever received... She was an absolute star and I can't emphasize enough how amazing she was! Incredibly sweet and extremely helpful too.. High praises all round. We got talking about skincare and how I feel that when I apply moisturiser my skin is often left oily after a couple of hours, so Victoria suggested I try the triple performing facial emulsion as it doesn't produce oil hence less clogging of pores. I went with this product at the end because it had a variety of skincare products which I really wanted to try out; the products would last me a maximum of 2 weeks ( a small amount of the product goes a long way) so if I liked a specific product it'd make sense to go and buy it rather than wasting money on something I may not favour after a while. I have used the total moisture facial cream before bed along with the it's potent eye cream and in the morning I use the triple performing facial emulsion (the smell is incredible honestly). The set comes with a small plastic carrier to put your skincare products and it's really handy for travelling. I have to say the packaging of the products is awesome! It looks like small potion bottles and all of them are quite petite which I love. If you guys would like to see a review on anything please let me know and I will definitely get that done for you! [The products above marked with an asterix were on offer 3 for 2]. I love the Barry M contour palette!